I can say now with conviction that there's no better time to visit the Michigan Capitol than on a rainy day with 25 parochial-school 4th-graders from ultra-rural Beal City. Accompanied by a good friend from California, I tagged along on a tour given by a retired special-education teacher who excellently maintained control and interest of both the students and the adults. 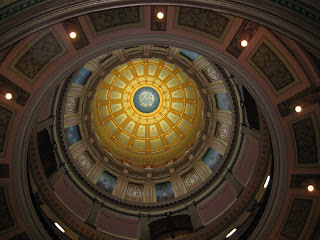 Together, we learned that the current Michigan Capitol, a grand, neoclassical domed structure, completed in 1878, is the third capitol to house the Michigan legislature. The first capitol was located in Detroit. A new temporary capitol was built in Lansing when the state capital was moved to this spot, shielded by marshy woods from the dangers of a Canadian invasion. The permanent capitol, built to be fireproof, was started in 1872 and finished in 1878. This building was built of brick with a cosmetic Ohio sandstone facade. Incidentally, the temporary wooden capitol burned to the ground in 1882. The Michigan Capitol successfully communicates the values I've perceived in Michigan and Michiganders: pride without pretension, open-ness with savvy. As a public space, the capitol welcomes visitors but then doesn't try over-hard to impress them. At the same time, the extraordinary attention to detail that went into the renovation of the building in the 1980s is apparent everywhere. The water-colored ceilings shine warmly and the textured paint on the walls and false-marble mouldings invite visitors to remain aware of their surroundings as they are gently urged by docents to get to know their legislators and their staffers, to think wisely about how the state's money is spent. In a building like this, I am reminded of the value of not always striving for that perfectly utilitarian image. Inspiration can be a tangible quality of a public space. This same inspirational quality suffuses the Detroit Institute of the Arts, located in an accessible section of Detroit right off of I94. Detroit's grand boulevards do not glitter, especially in the driving autumn rain and the DIA, accessible now primarily via its limestone annex does not overwhelm the visitor with grandeur upon entry. The inspiration emerges through the process of discovery within the museum. Everywhere are internal courtyards filled with light that seem to invite the visitor to stumble upon them. The first we found was the Kresge court designed with 4 facades each meant to evoke a different period in the history of European art. The most astonishing space we stumbled upon in the museum was the Rivera court. Perhaps, our experience serves as a testament to the unplanned, serendipitous museum visit. 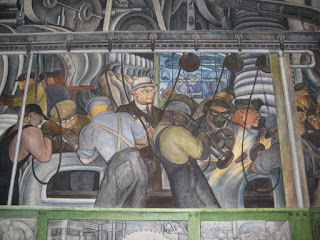 We literally ran into the Diego Rivera Detroit Industry murals as we wandered from early European art to modernism. Suddenly, we were surrounded by a magnifcent and disturbing allegory of industry: the delicate balance with the natural world and the ambiguous consequences for social systems. Each figure was rendered with a larger-than-life humanity. I've purchased the definitive book on the murals and look forward to returning to the museum for a more informed visit next time; perhaps I'll listen to the (free!) audio tour and mix my awe with guided interpretation. In general, the DIA does an excellent job of offering educational interpretation within its galleries, moving beyond the conoisseur-model and toward a more informative approach. As my husband noted with approval, the DIA feels like a cultural history museum, not just like an art museum. It's the dawning of my second full day on Mackinac Island in Lake Huron where Michigan's mitten meets the upper peninsula, connected by the thin, but elegant filament of the Mackinac Bridge. Mackinac Island is Michigan's most popular tourist destination; it's been in the trade since the mid-19th century and has managed to maintain its niche through a unique mix of historical interpretation, natural beauty and family-oriented resort attractions. Mackinac Island is small, only 9 miles in circumference, and expresses a unified self-awareness spanning over a century. In the 1890s, shortly after the construction of the Grand Hotel, the islanders glimpsed the likely trajectory of their home and source of livelihood when the wealthy summer folks from the burgeoning cities of Detroit and Chicago brought their newest playthings to the island: automobiles. Through a heated municipal debate which I am sure involved more controversy than made it into the island's genesis stories, the city on Mackinac voted to ban "horseless carriages" of all kinds. Shortly afterward, the state park that made up the majority of the island followed suit. Today, Mackinac is fully electrified and its roads are paved, but it retains an 1890s look and feel. It is peaceful with streets where bicycles are the fastest means of transportation. Far from feeling like a quaint anachronism, Mackinac holds an interesting environmental potential: with enough bicycle parking, it is not at all ridiculous to believe that this balance could be achieved in other places. 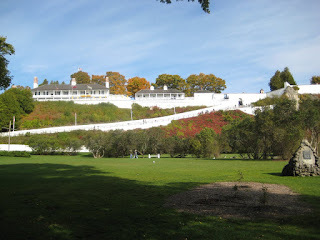 Aside from the experience of the island itself, Fort Mackinac offers historical interpretation of both the fort itself, dating from the late 18th century and rising on a hill above the town, and of the arc of history for the entire island. To me, it seems clear that more curatorial and museological effort has been invested in the interpretive exhibits in the buildings and grounds of the fort than in the "museum" of Mackinac's history. The fort offers a self-guided experience painting a picture of a choice military post during most of the 19th century. This was a place where officers could bring their wives and families and enjoy social gatherings where "ducks and geese, oysters and fresh fruits and vegetables were served," prepared by cheerful Irish and African-American kitchen servants. This was a "healthy" post where the military doctor treated common diseases like consumption and was free to employ some of the new scientific techniques trickling across the pond from Europe. The medical exhibit is innovative, using projection technology to compare accounts from the post's doctor (played by a costumed actor) and a modern medical professional for comparison. The "historical" overview in the fort's museum space left something to be desired. Sponsored by Ford (and lacking a publication date-- how I wish museum exhibits were forced to state their years of development and completion-- but my guess would be the 60s or 70s), this exhibit felt like a textbook rendered on the walls with occasional artifacts (and some reproductions) supplied for illustration. In typical grand-America-narrative style, it glossed over conflicts with Native Americans and obscured the circumstances of the various struggles with the British. At the same time, it was the kind of exhibit that is immensely fun to read between the lines. Sometimes, the very hokey, silly stuff can provide a more interesting challenge to the knowledgeable viewer than the painstakingly balanced, earnestly interactive attempts of contemporary historical interpreters. All in all, Mackinac does not disappoint.